Philosophy and sociology of science aim at understanding the workings of scientific endeavour. Despite their different emphasis and methodology, they deal with the same subject matter; and yet, they seem to be worlds apart. In the course of the last few decades, steps have been taken towards a (partial) reconciliation. The conference FotFS VII was part of this process, bringing sociological aspects into philosophy of science and philosophical aspects into sociology of science. Since the FotFS conference series focusses on the formal sciences, the conference had a certain, but non-exclusive focus on the role of mathematics as one of the sciences covered by philosophy and sociology. FotFS VII was organized by the research network PhiMSAMP Philosophy of Mathematics:Sociological Aspects and Mathematical Practice. A volume documenting the work of this network has already been published in the series Texts in Philosophy and covers specific questions linking philosophical issues in mathematics to mathematical practice. The present volume provides the general methodological background for the work done by the PhiMSAMP network. 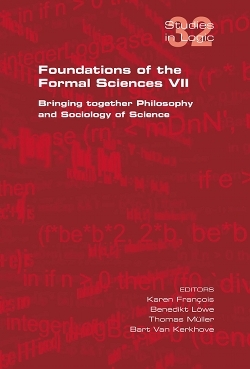 It contains fully refereed versions of papers presented at the seventh installment of the conference series Foundations of the Formal Sciences (FotFS).